Planning a really romantic day in Ireland? Let's face it - anybody can buy a box of chocolates, a bottle of bubbly, a few roses, a candle, for a kind of instant romance. Throw in a dinner for two and you're set. That might be what you think. But is this really what she (or he) really desires? Ireland offers much better ways to say "I Love You" and maybe even pop the big question. Here are some of the most romantic things to do in Ireland. Is there anything more romantic than being treated like a real-life princess (or prince)? Plan an incredible stay at one of Ireland's most beautiful castle hotels and splurge on a day at the spa. 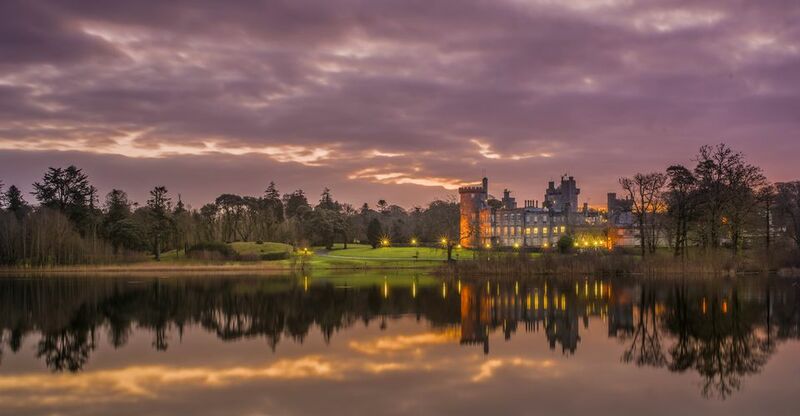 From the isolated beauty of Ballynahinch Castle in Co. Galway, to the irresistible charm of Adair Manor and the thatched-roof pubs and houses of its surrounding village - Ireland's dreamy castles were made for romance. Not many people know that Saint Valentine, Patron Saint of Lovers, can actually be found in Dublin. More precisely, a part of Valentine can be found a church in Whitefriar Street (Aungier Street), built in the 19th century. In 1835 Pope Gregory XVI gave the relics of Saint Valentine to the Carmelite Church there, to boost Catholicism in Ireland. St. Valentine was martyred for helping couples secretly marry, and his penchant for romance makes for a sweet tale even today. Pay homage to his relics with your favorite person and start your very own modern love story. Everyone knows that horse and carriage is the most romantic way to travel. Planning this romantic day out in Ireland is going to cost you but it will be worth it! Travel to Killarney and talk to a few "jarveys", the men hanging around town with their horse-drawn carts. If you arrange it all in advance, the carriage will pick you up in the morning, complete with a fully-stocked picnic basket. You will then have a personal guide (and coach-driver) for a unique day out in one of the prettiest areas of the country. Providing the changeable Irish weather is holding up it should be a perfect "old Irish experience". Riding around the National Park in an open cab, seeing the deer in the fields, and stopping champagne on the way to Ross Castle will create an unforgettable day. Even if you don't stay in a castle, you can still dine in one! Medieval banquets are available in several Irish castles, Bunratty being the best known. You are treated like guests at a Renaissance court, complete with food and entertainment. If you are planning to pop the question, phone ahead to inform the team of your intention to propose - they may well accommodate you and arrange for a minstrel serenading your lady love while you offer the ring. Rest assured that you will not be challenged to a quick joust to win her favor. Another special event that might set you back by a few Euros but provide a true bird's eye view (from below) is to fly by the Cliffs of Moher. The windswept Cliffs of Moher are normally only seen from above, or maybe from a boat but you can arrange for a stunning helicopter fly by. The aerial experience will bring you on par with the seabirds that make the cliffs their home. And why not take in the Aran Islands as well? Let the chopper drop you off there and spend the rest of day walking, enjoying seafood and finally snuggling up in a cozy B&B. Contact Elite Aviation and Executive Helicopters in Galway for possible charter. Make like Leonardo and Kate in "Titanic"
Everybody knows the scene at the prow of the Titanic, the iconic view of Leo showing Kate how to fly. Though the doomed ship was built and last seen in Ireland (Belfast and Cobh respectively), a re-enactment of that scene might not be so easy, especially with modern safety regulations on passenger ships. But an alternative would be to walk out onto Titanic's prow and having a Kate moment - at Titanic Belfast. The outline of the sister ships Titanic and Olympic are part of the exhibition, and people have been seen re-enacting THAT scene there. Taking along a CD player loaded with Celine Dion is strictly optional! Whatever geologists say, the Giant's Causeway was really built by Finn MacCool to head over to Scotland. One version of the story suggests that the giant supposedly built the 40,000 basalt columns as a kind of bridge to cross in order to meet his great love, a Scottish giantess. What better place to swear that you would cross the stormiest seas for your true love? Provided the proverbial Irish weather plays along you will even see the Scottish coastline on the horizon. Ireland may not have tropical weather but it does have islands full of unique beauty. Even if a helicopter is not in the cards, you can plan a romantic ferry trip out for the day to one of Ireland's prettiest islands. Take in the sunset over the Blaskett Islands, or wander through the gardens at Garnish Island - while holding hands, of course. Dublin is not generally known for its romantic couples throughout history - James Joyce's books tend to describe flawed relationships, Molly Malone died of a fever and Oscar Wilde found himself in jail for who he dared to love. But remember that Dean Jonathan Swift of "Gulliver" fame composed some of his best prose for his beloved Stella. Both are long dead, but their love is kept alive in people's memories by Swift's writings. You can visit their burial places, where they lay for eternity next to each other, in St. Patrick's Cathedral. The National Cathedral of Ireland is a dignified setting for any proclamation of undying love and makes for a romantic day out in the Irish capital.